U.S. stocks ended the week higher for the first time in three weeks, after the European Central Bank satisfied investors with an unlimited bond buying program and hopes grew that the Federal Reserve will follow through with its own stimulus program next week. The S&P 500 and Nasdaq rose more than 2% for the week, posting their biggest gains since early June. The Dow Jones industrial average added 1.6% for the week. All three indexes finished the week at fresh multi-year highs. The S&P 500 closed at the highest level since January 2008, while the Dow closed at the best level since December 2007. The Nasdaq manged to close at the highest level since November 2000. While the bulk of the gains came earlier in the week after ECB president Mario Draghi unveiled details of a new bond-buying program, known as Outright Monetary Transactions, or OMTs, stocks nudged higher on Friday as investors grew optimistic that the weak August jobs report will prompt the Fed and Ben Bernanke to jumpstart the slowing economy with stimulus when it meets next week. The Labor Department reported that 96,000 jobs were added in August, well below the 120,000 jobs that the economists surveyed by CNNMoney were looking for. The Labor Department also lowered the job creation estimates for June and July, painting an even bleaker picture. The unemployment rate ticked down to 8.1% from 8.3%, but only as a result of a significant drop in the number of people looking for jobs. Economists were expecting the jobless rate to hold steady at 8.3%. 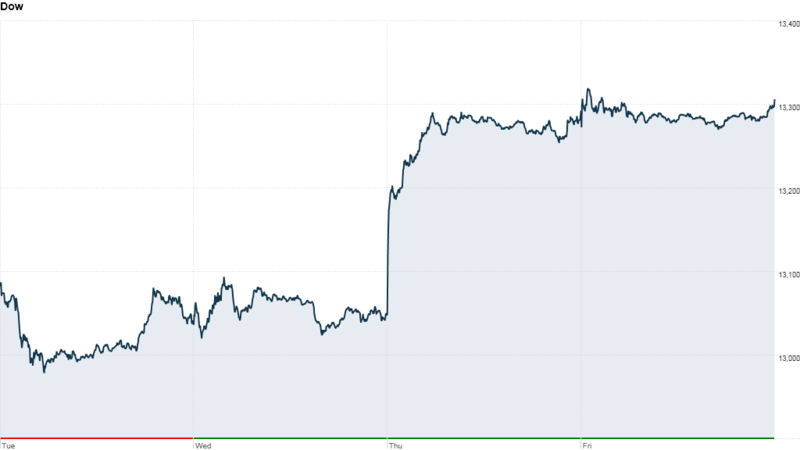 After several positive reports on the labor market Thursday came in higher than economists had anticipated, investors were hopeful that Friday's jobs report would continue to show an improvement. "Whatever sense of optimism had been generated by those comparatively positive signs may not be completely dashed by this report, but it certainly puts a damper on that mood," said Jim Baird, chief investment strategist at Plante Moran Financial Advisors. These numbers are particularly important to investors this month, since it will likely influence the Fed's decision on whether to announce a third round of quantitative easing, or QE3, at the conclusion of its next meeting on Sept. 12-13. "In recent months, the Fed appears to have been closely weighing whether or not to take additional steps to provide additional stimulus, but has seemingly been lacking consensus within the committee on whether or not such steps are warranted at this point," said Baird. "Today's disappointing report certainly increased the odds that the Fed will take action when it meets next week." The weak jobs data and hopes for Fed action pushed investors toward government debt. U.S. Treasuries rose, sending the yield on the 10-year note down to 1.66% from 1.67% late Thursday. The price of gold, which is used as a hedge against inflation, jumped on the chance that the Fed will inject the economy with more stimulus. The yellow metal rose more than 2% to settle at $1,740.50 an ounce. Conversely, the increased odds of QE3 weighed on the U.S dollar, as additional stimulus reduces the value of the greenback. The dollar declined against the euro, the British pound and the Japanese yen. 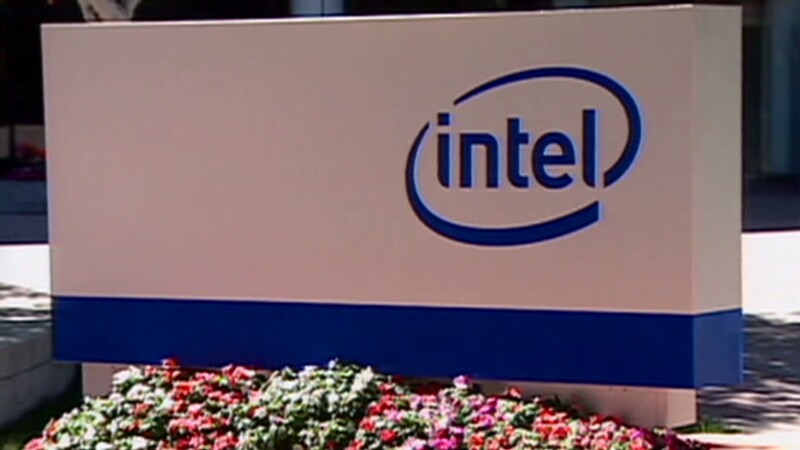 Companies: Intel (INTC) lowered its guidance for third-quarter revenue, citing "weaker than expected demand in a challenging macroeconomic environment." Shares slid more than 3% on the news. Lululemon's (LULU) stock rose after the yoga apparel company reported a 49% increase in second-quarter profit, and delivered a better-than-expected earnings outlook for the third quarter. Shares of Pandora (P) plunged almost 17% after Apple (AAPL) announced plans to launch a competing live streaming music option. Kraft (KFT) shares declined after the company warned that earnings for its snack business Mondelez International may be lower than expected due to unfavorable foreign exchange rates. Gunmaker Smith & Wesson Holding (SWHC) reported earnings and raised its full-year forecast Thursday, sending shares surging nearly 12%. Google (GOOG) shares topped $700 for the first time since December 2007. World Markets: European stocks closed with modest gains Friday, a day after the ECB announced plans to buy euro-area government bonds. Britain's FTSE 100 ticked up 0.3%, the DAX in Germany added 0.7% and France's CAC 40 gained 0.3%.